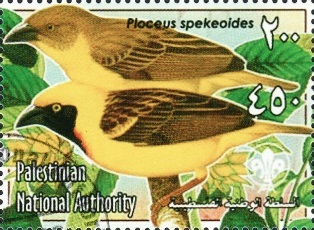 Several web sites feature birds on stamps, and generally these sites categorise the stamps by country and bird species. 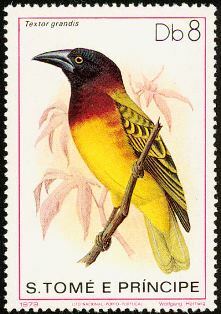 At least 57 weaver species feature on stamps, ie nearly half of the 117 known weaver species globally. The weaver species that has featured on stamps most often is the Madagascar Red Fody, a species introduced to a large number of Indian Ocean islands. This is followed by the Village Weaver, one of the most widespread and conspicous weavers in Africa. Many rare or restricted range weavers feature at least on one stamp, eg. Fox's Weaver (endemic to Uganda), and Principe Golden Weaver (found only on Principe Island).